In recent years, copyright violations due to the illegal copying and distribution of e-comic contents have become an important issue. Although such violations can be rapidly and reliably detected by fingerprinting techniques, scanning introduces photometric and geometric distortions. 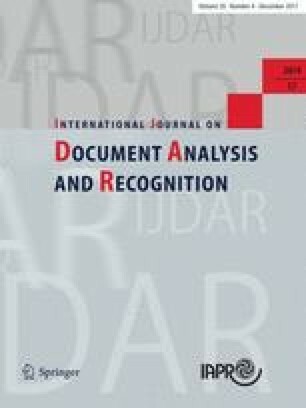 This paper presents a restoration framework for reducing photometric and geometric distortions in copied comics to improve their content identification. First, the photometric distortion is reduced by conventional homomorphic filtering with histogram equalization. Next, the corner detection is improved by a consecutive pixel difference method. Once the corners are obtained for each page, the geometrical distortion is rectified by a perspective transformation method. When two adjacent pages are coupled, as often occurs in scanned and camera-captured comics, they are separated by a simple low-energy point method. The distortion-reducing performance is measured in terms of identification accuracy using the Hamming distance. In a simulation study, our proposed scheme improved the average fingerprint identification accuracy by more than 30 percentage point for single-page comics and by 28 percentage point for double-page comics, relative to conventional methods. We also analyzed the execution time of distortion reduction and page separation in low-, medium- and high-resolution images. Even for large images, the average processing time of our scheme was within 2 s, which is a sufficiently short time for commercial applications.